Safety concerns raised several years ago at a zoo where a tiger killed a keeper were fully addressed, the licensing authority has said. Rosa King, 33, died at Hamerton Zoo Park in Cambridgeshire on Monday. The findings of a 2012 inspection report highlighting damaged fencing and concerns over "escape protocol" were widely reported after her death. However, the local council confirmed its recommendations were "fully complied with". Ms King, whose family home is in Chippenham, Wiltshire, had worked at the zoo for 14 years. A joint investigation by police and Huntingdonshire District Council - which is responsible for licensing the zoo - is currently under way to determine how the incident happened. The last inspection report the council has been able to provide to the BBC dates from 2013. When inspectors visited the zoo in 2012 they advised the owners to "review, repair and replace [an] ageing/damaged perimeter fence where the structural integrity of the fence is compromised" and said "the escape protocol should be amended to to categorise animals of varying sizes". However, a council spokesman has confirmed "all of the conditions on that report were fully complied with" and the zoo's licence was renewed by the authority same year. It expires in 2019. The zoo has been closed since the incident on Monday morning and the council was unable to say when it might re-open or how long the investigation might last. It has not responded to any other questions from the BBC. 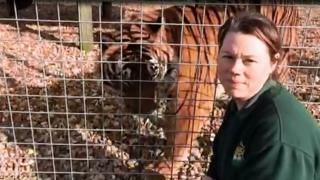 Earlier this week police confirmed the tiger which killed Ms King was unharmed and was still alive. Meanwhile, colleagues have paid tribute to the senior keeper. In a statement released by the zoo, they said: "Rosa was not only an invaluable and highly respected member of our team, first and foremost, she was our friend and we miss her very much. "Rosa's passion and commitment to animals and wildlife were an inspiration to all those who worked with and knew her. "We are still coming to terms with what has happened." Details of how Ms King died have not yet been released, and an inquest is expected to take place next week.